Green water can be a problem for any size of pond. Colored water, which is often some shade of green, may also be brown or sometimes red. In nearly every case what you're seeing a very small, single cell algae that is floating around in the water. In small amounts the water may remain clear or show a very slight tinting but as the density grows, the color of the water will grow more apparent. There are several ways to address green water problems and we'll address small and large ponds separately here. 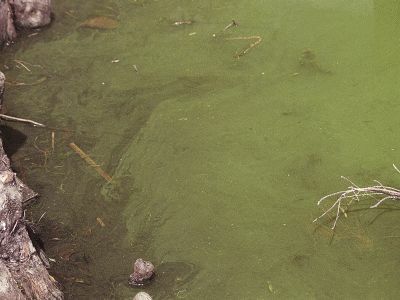 For a small backyard pond, up to about 10,000 gallons (although this amount can vary a good bit and may go as high as 50,000 gallons) it may be feasable to use an Ultra Violet light that's designed to damage or kill this single cell algae and make it clump together. In larger clumps, a biofilter or mechanical filter will have an easier time of removing it from the water. It's important with UV to have a good bulb installed and to get the flow rate of the water set correctly. If water is passing too quickly past the light, the algae may not be affected as much. Slowing the flow rate down will provide better coverage and control in some cases. Visit this page to learn more about Ultra Violet Pond Treatments. In addition to UV we often suggest using some form of beneficial bacteria to help lower nutrients in the water. Our small pond 2500 gallon system can be useful for this. This treatment is very safe for fish and wildlife of all kinds. We also like to suggest that the pond owner install more surface based plants to provide shading to the pond. With green water, sun exposure appears to play a big role in helping this algae grow, so providing some form of physical shade is very important. Plants offer the best option for this in the form of lilies and other surface plants. Finally it's a good idea to check fish loading if you have any kind of abundant algae in a smaller pond. It's very easy and common for fish to grow and multiply until they begin to strain the pond. Due to increased waste from the fish that overwhelms the biofilter or other controls, algae can grow very well. We suggest no less than 10 gallons of water for every inch of goldfish and no less than 25 gallons of water for every inch of Koi. By adding up your total "fish inches" you can determine if your pond is overstocked and identify one of your possible supporters of prolific algae growth. Larger ponds with green water issues can be more difficult to treat than a smaller pond. We may still suggest a beneficial bacteria treatment for at least several months to try and clean the pond up for it's organic influences. The BioSphere Pro bacteria along with the Bio-Blast are both useful for large pond treatments. You can learn more about our experience with Ultrasonic Algae Control and find the right model to suit your pond size. And visit the Questions About Ultrasound page to find answers to common questions. If you have additional questions about dealing with green water in your pond please contact us for more information. Or if you'd like to post your questions below in the comments section we can share our Q & A with other pond owners.